As our diocese has embarked on its first new church plant in decades, many of us may have questions: Why do we need to plant churches when so many churches around us are failing? What would an Episcopal Church plant look like? What would it take to help a new church succeed? God Gave the Growth’s first section deals with the basic issues concerning church planting, including specifics about church planting in the Episcopal Church. Two chapters provide reasons for planting new churches, including the ways that new plants can benefit existing churches. Then the book looks at types and models of church planting, including a discussion of the need to continue doing traditional church plants. The second section deals with factors promoting church planting success. Here Susan addresses topics including important characteristics of church planters, discerning a new plant’s mission, the formation of a leadership team, methods of evangelistic community outreach, the launch, the formation of disciples, the worship facility, and finances and stewardship. Susan’s final section provides wisdom and counsel for diocesan and church leaders who want to see successful new churches planted in their dioceses. Without the vision and support of current established churches, new plants are much less likely to succeed. While God Gave the Growth is contains needed statistics, models, principles and explanations concerning different aspects of church planting, part of the book’s strength comes from extended quotations from various Episcopal church planters. Throughout the book, we hear elements of Susan’s own story, but we also hear stories of Episcopal church planters who have started churches in a working class area in Georgia, in a wealthy area of Los Angeles, with the homeless, with Latino communities, and in other contexts. We also hear from Bishop Andy Doyle of Texas, whose diocese has planted numerous churches in recent years, and other Episcopal Church leaders. 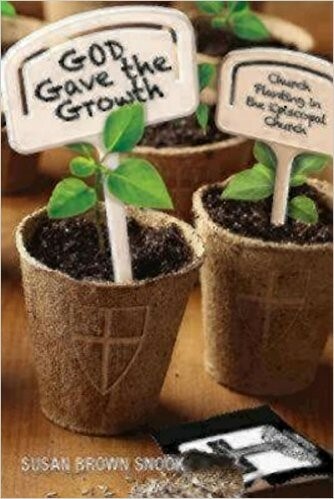 Overall, God Gave the Growth is a helpful and inspirational book for anyone interested in learning more about church planting in the Episcopal church. It is an especially important book for our Diocese at this time. This entry was posted in Congregational Development, Ministries. Bookmark the permalink.